My wife ordered something called “Cajun Pasta” from a restaurant once, and she really liked it, so much she asked me to give it a try sometime. She liked my version, and it’s since worked its way into a semi-regular rotation on the weekend meal list. Chop up vegetables, cut up chicken and sausage. Cover the chicken pieces liberally in the Cajun/Creole seasoning of your choice– I used Tony Chachere’s Creole Seasoning. Add a tablespoon of olive oil to a pan, get it good and hot, and brown the chicken and sausage. Then add the vegetables and cook until the veggies start to soften up, then we’ll take the cooked meat and veggies off the heat and set aside. Most other Cajun Pasta recipes online call for adding heavy cream, and I’m sure those versions are really good, but I like to keep it a little lighter with my version (and I didn’t have any heavy cream anyway). So I made a roux, as with the Gumbo/Jambalaya recipe, but using 1/4 cup or a little less of olive oil. Add the olive oil to a pot large enough to finish cooking all the ingredients. Heat the oil on medium heat and gradually add the flour, stirring it in constantly. Since we’re using olive oil, which doesn’t withstand heat as well as butter or peanut oil, don’t cook the roux until it’s browned, we’ll go with a “blond” roux– just cook and stir until it’s the consistency, but not the color, of peanut butter. 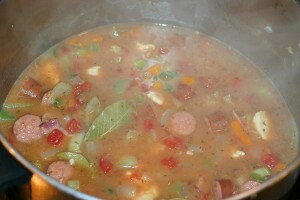 When the roux is ready, add the cooked meat and veggies, the tomatoes, and slowly add and stir in the chicken stock. Add the seasonings, including more of the Cajun/Creole seasoning if you like. 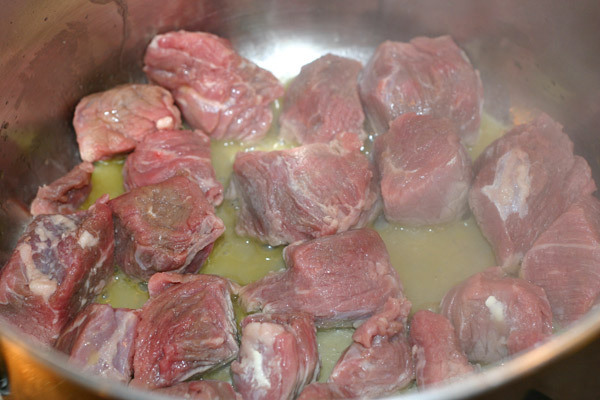 Simmer for about 20 minutes- 1/2 hour. Add the lime juice when it’s almost done cooking. Serve over your favorite pasta (I used penne rigate), and add shredded parmesan cheese, and some chopped parsley if you like. Enjoy! Paella is a dish originated by Spanish peasants, who used whatever they had on hand that day to make it, with local vegetables and whatever meat they could get hold of– often rabbit. That sense of improvisation makes paella perfect for RecipeOptions.com. Over the years I’ve made many variations on Paella (Haven’t tried a version with rabbit yet, though). 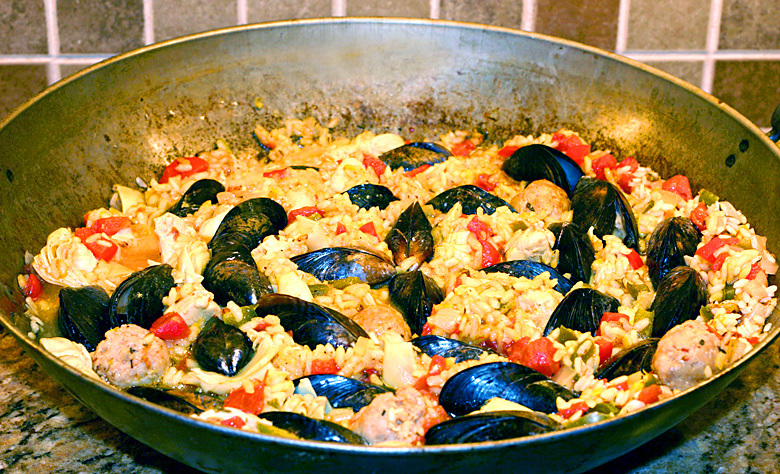 Often Paella has a combination of meats, seafood being very prominent. But I’ve made a version that was chicken-only when we had a friend over who was allergic to shellfish. And it would be very easy to make a very good vegetarian Paella, maybe with some eggplant added. So feel free to experiment with your own ingredients! Pretty much the only constant ingredients when making paella are some type of short-grain rice and saffron. Fun fact about saffron- it’s one of the most expensive, if not the most expensive, spices per pound in the world. But don’t let that discourage you and decide to leave it out– you only use a very small amount. The distinctive bright yellow color and the unique and very distinctive flavor saffron adds to Paella makes it a very key ingredient. For the rice, I used to use Arborio, the same style used for Risotto, but I recently read that it’s too starchy for Paella– the starchiness of Arborio is what gives Risotto that creamy texture when you stir the Risotto while it’s cooking. So for this recipe I tried a “Calrose” rice. I’ve heard Valencia or Calasparra are better, but they may be hard to find and may require purchasing online. So for my version these days I’ve settled on a combo of chicken, Mexican Chorizo (I take it out of its casing and roll up little chorizo meatballs), shrimp and mussels. Spanish Chorizo might be a more “authentic” choice but I like the Mexican version. As for vegetables, my version is a little more unothodox– I like adding artichoke hearts, which I don’t think I ever saw in any Paella recipe but I think works in my version. Peas seem to be typical in every other Paella recipe I’ve seen, but peas are one of the few vegetables I’m not really crazy about, so I leave them out. Please feel free to add peas to yours if you like them. I’ve joked my version should really be called “Aella”, because….no P’s! (Sorry, that’s why I don’t write a humor blog). With its bright colors– the bright yellow from the saffron, the green and red of the peppers and tomatoes, this makes a festive meal for around the holidays. Many families have a “Feast of Seven Fishes” tradition on Christmas Eve– an all-seafood Paella could easily be part of that. 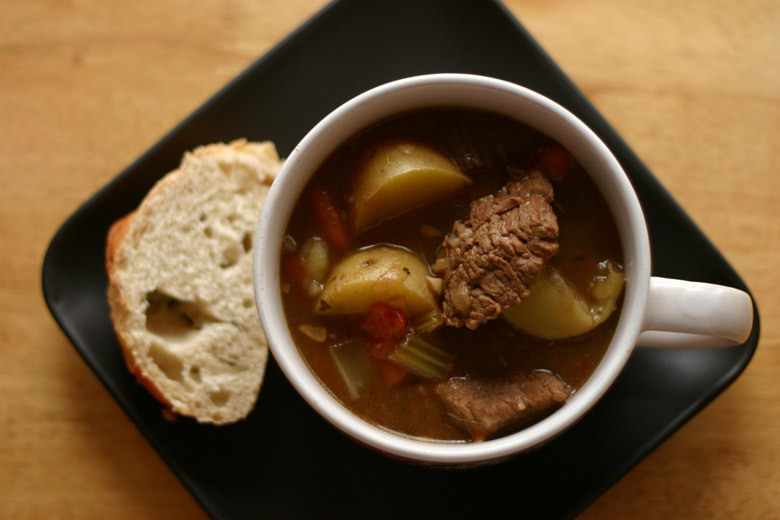 Heck, even if you’re looking for something a little different for Christmas dinner. Or this would work for a New Year’s Eve dinner as well. Anytime is Paella time. Enjoy! I used a heavy-duty iron wok, which actually works really well for making Paella. An authentic paella pan would of course be best, but any deep, wide pot with a heavy-duty bottom would work. 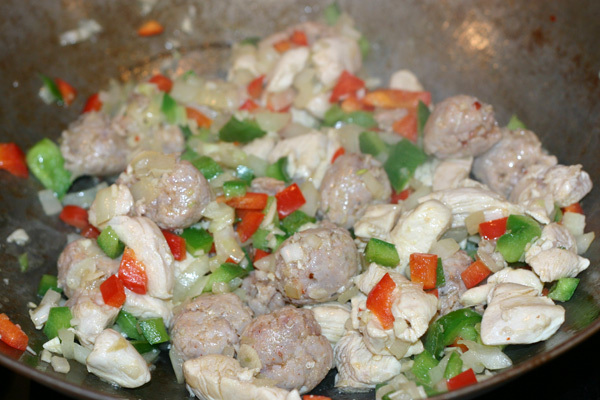 Chop chicken into 1″ pieces; take chorizo out of casing and roll into small (1″) meatballs. Dice pepper and onion and mince up garlic cloves. Heat up chicken stock in a separate pan and keep hot, just under a simmer. Add olive oil to pan or wok and heat on high. 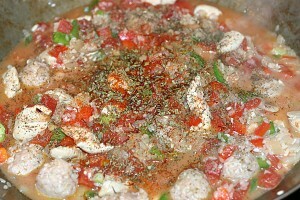 When good and hot, add chicken and chorizo and stir frequently until the meat is browned. Add diced pepper and onion and stir until they’ve started to cook through. 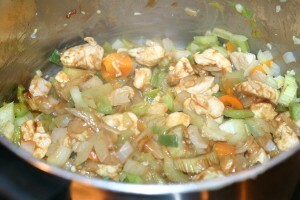 Add minced garlic and stir until the vegetables are almost cooked through. Add rice and stir until the rice has been coated with oil and mixed in well. Then add the can of tomatoes, lemon juice, clam juice and seasonings. Stir together, then cover and set on low-medium heat. Check at regular intervals and add the hot chicken stock to the Paella as the rice absorbs the liquid. Rinse the mussels off with cold water and give them a scrub if you like. Remove the “beards”– the stringy fibers the mussel used to anchor itself. Make sure all mussel shells are tightly closed. If any are open and don’t close immediately with a couple taps against the counter, discard. 10-15 minutes before the rice is finished cooking (about 30 minutes, 40-45 total cooking time), add the shrimp and mussels. Since the rice can’t really be stirred at this point, push the shrimp down and fold into the rice so it’s completely covered. Push the mussels about halfway down into the rice and cover the Paella. Cook or 10 or so more minutes, until the mussel shells have opened. discard any shells that don’t open after cooking. My version of Jambalaya/Gumbo is one of my favorites to make (and to eat!). I made this with a roux (mix of oil and flour) to thicken it up and give it more flavor, and Jambalaya is typically made without a roux, so this is probably more of a Gumbo. But when I think Gumbo I think of adding okra, of which this has none. And this has tomatoes, which I think makes it Creole, the Cajun version having no tomatoes, I believe. So, Jambalaya or Gumbo? Creole or Cajun style? I don’t know, but I know it sure is good. Since this is Recipe Options, before I give my recipe I should say there’s no need to stick to it! There’s a lot of variation with Creole/Cajun style meals. They usually all have the “holy trinity” of vegetables: bell pepper, onion and celery. And there’s also a “holy trinity” of herbs I think of as being necessary to Creole/Cajun style– thyme, oregano and bay leaves. And there should be some heat added with cayenne pepper, depending on how spicy you like it. 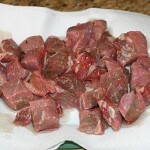 After that, it’s wide open– three types of meat are pretty typical- sausage, chicken and some type of seafood. 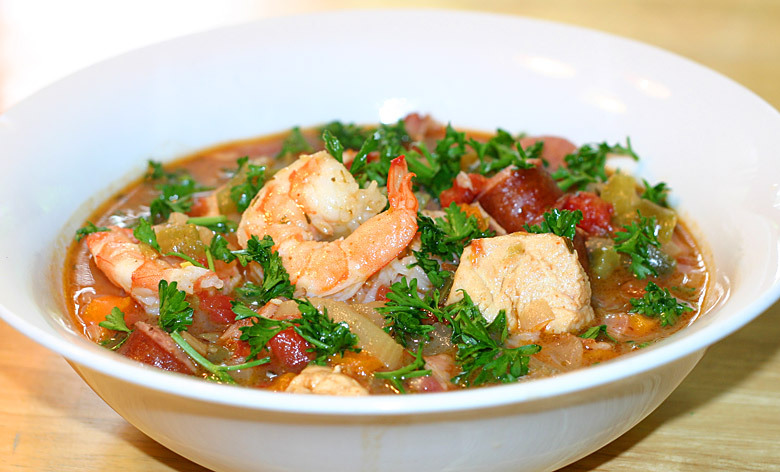 But if you just have shrimp, it’s a Creole shrimp stew! Or try crab meat instead of shrimp. If you don’t have sausage, I’ve used bacon and that works well. I mentioned tomato vs. no tomato. 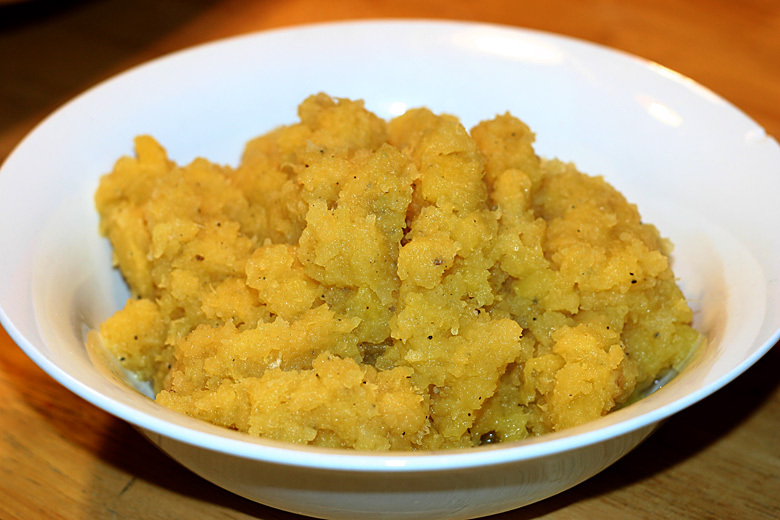 I also mentioned roux vs. no roux– I’ve made this plenty of times without a roux, and it’s still plenty good– and a lot faster to make. I add a little lime juice to my recipe, and that’s not traditional, but I think it really works with the other ingredients. We like it spicy, so I often add Tabasco sauce, as well as Jalapeno peppers or whatever peppers I might have on hand- Hungarian, Serrano, Thai-style peppers, etc. Never tried throwing a Habanero pepper in there, but I bet that would be really good. Some recipes call for a shot of Worcestershire sauce– sometimes I add some, sometimes not, depending on what mood I’m in. When it gets to the simmering stage, I’m tasting it and deciding if it needs a little more of this or that. Some dishes call for simplicity, but this is one that really brings out the mad scientist in me. Chop up vegetables and cut up chicken and sausage into not too small pieces. 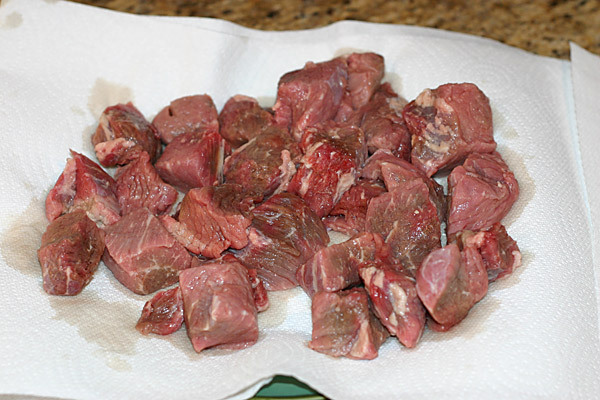 Mince up the garlic into small pieces. 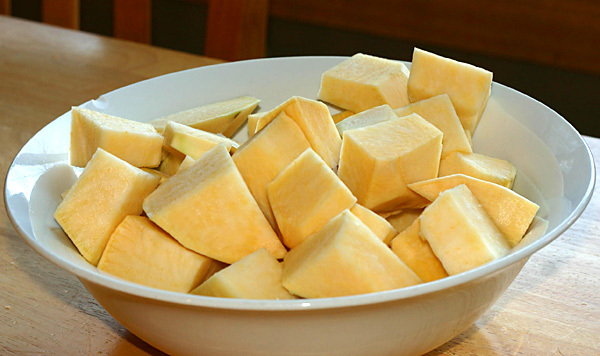 Here’s a good article that covers cooking terminology like chopped vs. diced vs. minced. If the shrimp has shells, remove them and you can simmer the shells in the chicken stock for awhile to give the stock more of a seafood flavor. Otherwise, you can add a bottle of clam juice instead. Or do both! 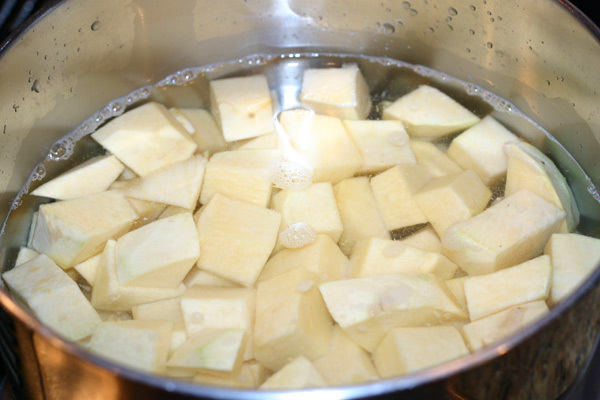 Heat up the peanut oil (or peanut oil and butter, or 100% butter) on medium-low heat in a large pot and add the flour a little at a time, stirring constantly. 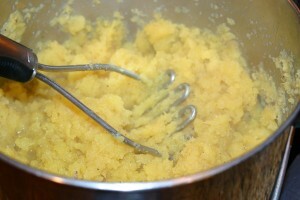 Keep adding flour until the mix of oil and flour (the roux) has a paste-like consistency. 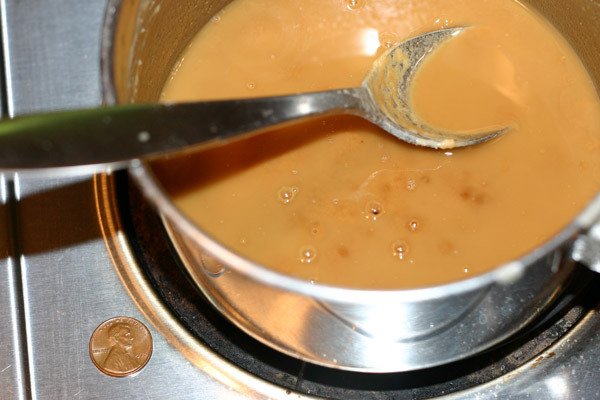 Keep stirring, stirring until the roux is a nice medium reddish-brown color, the color of peanut butter or an old penny. This will take about 1/2 hour to 45 minutes. 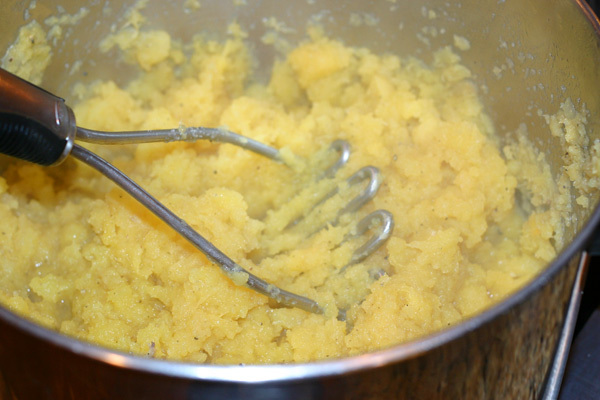 To stop stirring for too long is to burn the roux. While stirring the roux, I like to cook the chicken and vegetables (and the sausage if it’s uncooked, but not the garlic yet) with a little oil in a separate skillet. Then, when the roux is done, add the chicken, sausage, vegetables and garlic, and stir some more, letting it all cook a little more and blend. Start adding the chicken stock (don’t forget to remove the shells if you added them), a little at a time, until it’s mixed in and has a good stew-like consistency, not too thick or too thin. The chicken stock should be hot or at least warmed up before it’s added to the roux in order to mix properly. Now add the tomatoes, herbs and spices (all the rest of the ingredients besides the parsley, shrimp and lime juice), and let it all simmer for about 1/2 hour-45 minutes. Add the shrimp at about the last minute of simmering. You want to cook the shrimp until it’s just turned translucent. 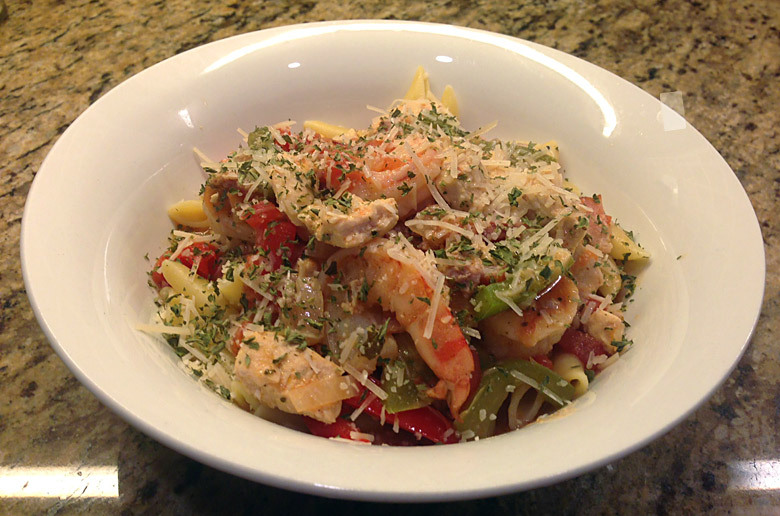 Shrimp should not be overcooked- you don’t want tough, rubbery shrimp! You can make the jambalaya/gumbo for the next day, and that’s fine– some say it’s even better the next day, when the flavors have had a chance to blend together. Just don’t add the shrimp until you heat it up again the next day. 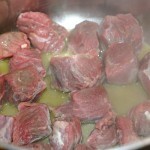 When it’s done simmering, mix in the lime juice, serve over rice and garnish with fresh diced parsley if you like. Enjoy!